Served as Dettingen Platoon commander from April 1963 to April 1964. Died in a climbing accident on Nuptse in the Himalayas. Gerry Owens was lost on Nuptse on the 9th. of May 1975, making a bid for the summit. He was last seen climbing in the summit couloir. Gerry's death ended a fine mountaineering career: Nuptse would have been his fourth major Himalayan peak in 7 years. In addition he was a fine all round sportsman, playing cricket and hockey for his Regiment, The Worcestershire and Sherwood Foresters. He was an enthusiastic ornithologist. He could on occasion be withdrawn and uncommunicative; on one of these (in the Kulu), he endured an avalanche in total silence as it flowed about him in a highly dangerous situation, and after it had passed ignored my expressions of relief and merely indicated that it was time to descend. He will be greatly missed by his friends, both in the mountains and his Regiment, and their deepest sympathy goes out to his fiancee. Gerry died at the height of his powers, at 37. In the 1974 Alpine season he had climbed 5 North Faces in the Oberland. including a solo ascent of the Silberhorn. At 07.15 on 9 May Owens and Summerton left Camp 7 for the top, 2300 ft above. In 1961 this had taken a full 12-hour day, the couloir then having been ice; in 1975 it was snow (certainly in its lower reaches). The two climbers were moving well one at a time up the couloir. After nearly three hours of climbing they were two thirds of the way up. The accident must have happened at about this time, 10.00. Those at Base Camp noticed that the couloir was empty; those climbing between camps 3 and 4 saw a stonefall on the South face of the mountain to their left, amongst the stones was a rucksack and an orange polythene bag. None of this news could be transmitted to me until 16.30 when we had our normal radio schedule. As I sat there at Camp 5 listening to this endless stream of words coming out of the earpiece of the walkie-talkie I could not at first believe that this was happening. Even then, while there was still some hope, one tried not to fear the worst. All that evening we waited in vain for the missing couple; for the sharp bright light to come over the summit col and make its way down the summit couloir. It began to snow. We all spent a sleepless night: could two climbers of such experience possibly disappear like this? We invented excuses as to why they had been delayed. The next day I asked Agnew and Krishna to go up into the couloir to search. But Krishna had been hit on the head by some rocks on the previous day and was not going too well. They saw nothing. We asked for a helicopter to come up from Kathmandu so that we could search the mountain face, but owing to bad weather it did not arrive until 11 May. 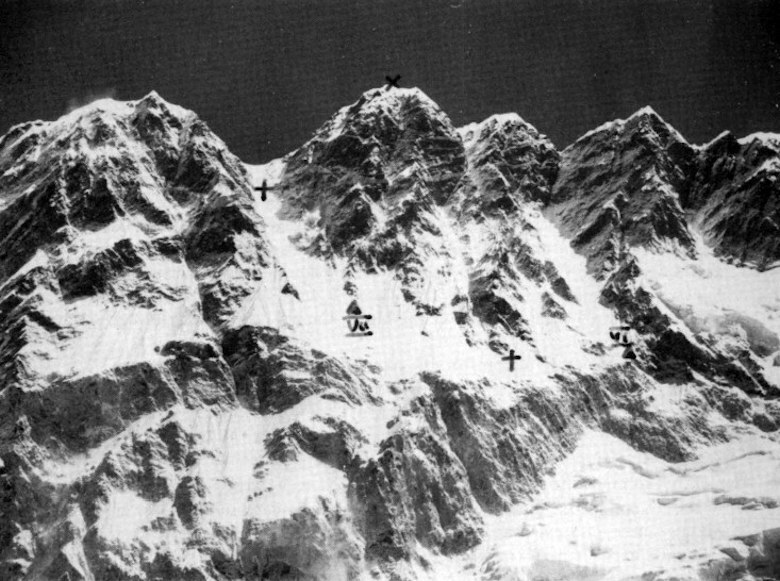 Peacock and Gifford climbed aboard and guided by radio by Muston and Winship, who had seen the original stonefall, landed as near to the head of the Nuptse Glacier as they could. Soon they located the bodies of Owens and Summerton in a crevasse, about 30 ft down, underneath the huge South face of the mountain. The weather was closing in again and there was no time to give a proper burial to our fallen friends. Deeply shocked they returned to Base Camp and gave me the news.